Write three compound words and show where the syllables divide. We don’t give prizes, but everyone knows that it’s pretty cool to have four or even five consonants in a row, as in worthwhile. Write words in which o says its own name. That lets us compare ways: with the help of silent e after a consonant, or with the help of an a in a vowel blend, or before certain consonant blends, as in cold, or in peculiar short words like O! Write a sentence that uses their, there, and they’re. (“All in the same sentence?” they ask, and I say, “Yes,” knowing they will come up, collectively, with a range of sentences, many funny, a few poignant, and at least one involving pink cake, since that seems to be important lately. The students write their responses on individual whiteboards about the size of printer paper, using erasable markers for which I will still be apologizing to the environment long after I’ve stopped teaching. Unfortunately, no other material works as well. Kids can’t resist writing on whiteboards with those vivid and deliciously slippery erasable markers. Of course, the plastic barrels of the markers will last two-thirds of forever in landfills. Please, one of my past students, or a reader of this blog, invent a biodegradable erasable marker, and then the karma will balance out. When everyone seems ready, I ask students to raise their whiteboards, using “the international raise your whiteboard hand signal,” a swooping wave. Of course I made up the idea that it’s an international signal. It does work, though–it means that everyone sees everyone’s contributions at once. There’s no prize for being first, no incentive to rush. If someone is clearly baffled, I say, “Don’t worry–you’ll get it on the next round.” As much as possible, I try to run enough rounds of the same type of prompt to give everyone a chance to catch on; few enough so we have time for other important things; and playful enough so it’s not boring for any kids who already have that skill down pat. Once all the white boards are raised, we look around the room–not to see who got it right and who got it wrong, but to notice variation and creativity within the direction. I read aloud some of the responses, and try to make sure that every student’s response is read aloud at some point in each lesson. Sometimes, I ask kids to read their own responses. Whenever possible, I ask them to notice and describe the patterns they see. We’re not about single correct or incorrect answers. We’re language scientists collecting evidence. We’re language artists or gymnasts, sharing our moves. We’re also language connoisseurs having fun. It really is fun, not just for me, but for the kids, who clamor for a tune-up if I try to leave it out on an unusually compressed day. Meanwhile, every time we do this–daily is the target–I learn an enormous amount about every kid in the class, and where they are on their learning journeys. Several thousand years ago, at a workshop about whole language learning, a participant asked, “I can see how good it is to give kids lots of time to read and write in class, but when will I have time to teach grammar and spelling?” Like me, she taught young adolescents, ten to twelve-year-olds. Like me, and every teacher I’ve ever known, she felt tremendous pressure on every minute in her schedule. That does seem to be partially true–true sometimes and in some ways. For example, some of the kids I taught had such strong auditory perception, and so much auditory experience, both in school and in well-educated, talkative, mainstream-culture families, that they could just test word order, phrasing and usage against their auditory memories, as they spoke or wrote or took the grammar sections of the standardized tests we administered for practice. For some kids, whatever sounded right was likely to be right. Other students could remember the spellings of all those words they’d seen, as enthusiastic readers given steady time in which to read in school, and also taking lots of time to read at home, much more than the homework guideline. Some could observe typical spelling patterns on their own, and apply them to new words they’d heard but not seen. If this is a science word, the f sound might be made by ph. Etc. Regardless of learning styles and preferences, more time to read always did help challenged spellers. But… Gradually I came to realize that highly motivated, fast and fluent readers might not be really looking at the insides of the words they read. They didn’t necessarily transfer their reading vocabulary into an accurately spelled writing vocabulary. Similarly, some very expressive speakers weren’t using conventional grammatical patterns in their speech, for a variety of reasons, including being surrounded by the fast and loose speech patterns of popular culture. So they couldn’t rely on what sounded right to tell them what was correct. Recently I’ve been reading paleoanthropology again, thinking about human evolution, and watching a very young learner as he figures out the connections between language and behavior. All that’s in my mind as I rethink language skills, and consider the idea that nearly all of us are well equipped to analyze patterns in the speech we hear, almost automatically, and then apply them in the speech we utter. We’ve evolved for that, over a very long stretch of time. But we haven’t been using written language for very long, as a species, and there seems to be huge variation in how well we’re equipped to transfer our speech metacognition to written language. Individual differences and anthropological observations aside, all the kids I taught were natural, intuitive language scientists, natural linguists of their home language, noticing and formulating and applying patterns, in some of their language experience, but not necessarily in all. Not as a function of ideology, or adherence to tradition, but as a result of pragmatic observation, I could see that most kids need some explicit teaching to supplement their own language science capabilities. In my experience, though, the best explicit teaching of language skills does exactly that: it supplements, encouraging, empowering and cheering on students’ own capabilities as language scientists–their ability to make systematic sense of the language they use. So the best language skills teaching will build on kids’ own observations about the spoken and written language of their experience. Furthermore, speaking to that long-ago question at the workshop: If we’re committed to giving kids plenty of time, every day, for actual reading and writing, then the language skills work has to be quick and efficient. Finally, everything we now know about learning says that language skills work, conceived of as language scientist training, will “take” best if it’s playful, the way so much real-world science is playful. I spent some time one summer mulling over my observations that far, and rereading Ethel Buchanan’s brilliant book Spelling for Whole Language Classrooms, in which she focuses on students’ own theories about spelling, at various stages, and describes helpful ways for teachers to work with kids’ ideas and move them forward. I was working off the model of math tune-ups in a favorite math curriculum, MathLand, tragically no longer in print. 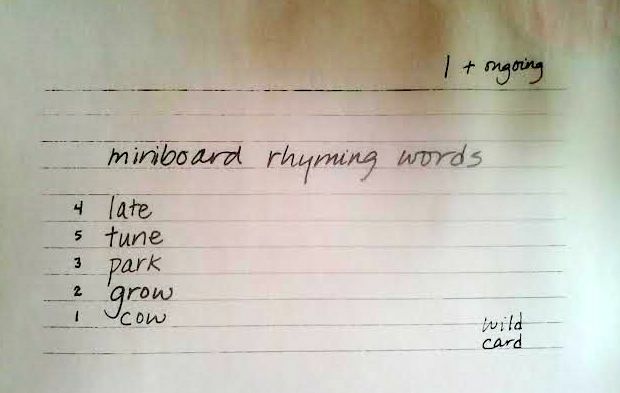 MathLand tune-ups often used individual write-on-wipe-off white-boards, mostly as a way for the teacher to see responses from the whole class, but sometimes for the class to see each others’ responses and problem-solving methods. 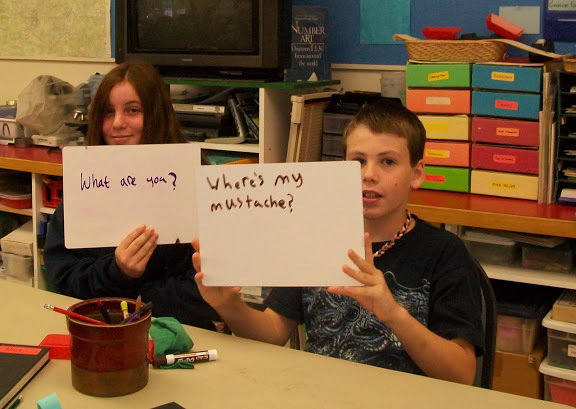 I planned to have students use whiteboards for literacy tune-ups, too. The MathLand tune-ups rotated among a number of skills, for example work with place value, strategies for estimation, and skills for working with time and money. Similarly, I planned to rotate among a number of language skills, including spelling patterns, punctuation, subject and verb agreement, prefixes and suffixes, some basic sentence diagramming, and more. Pages like this kept on a clipboard, a sheet for each student, helped me keep track of student responses. I didn’t try to write down every student’s response to every lesson, just things that would help me support individual kids or the class as a whole. As we went along, I learned to make my questions or prompts increasingly open-ended, because that was more fun, and also more productive. Sharing data is really different from getting the one right answer (or not.) The kids’ responses were often hilarious, and I learned to go with that, to let it happen, to let kids have obsessions with fictional characters–or pink cake, or bacon. So often, teaching young adolescents, I felt regret about aspects of the world they were entering, and the history they explored with me. The history of slavery, or the continuing reality of slavery in the world; the consequences of heedless fossil fuel use. I felt sad to have to open up these facts. Framing language skills work as a feast of variation and nuance, a celebration of our rich and multifaceted, multi-sourced English (American flavor), I felt thrilled to welcome my students into something complex but unquestionably wonderful, a treasure / parade / three-ring circus that’s free. To think of it that way changed the whole game, for all of us. 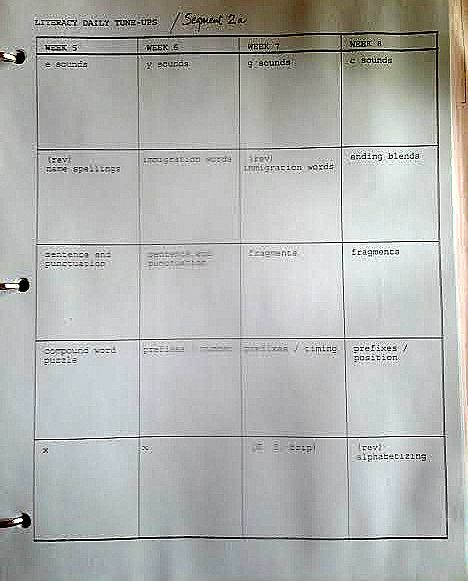 This entry was posted in Assessment, Class life, Reading and writing and tagged Ethel Buchanan, grammar, individualizing language skills instruction, language skills, literacy, literacy tune-ups, MathLand, punctuation, spelling, Spelling for Whole Language Classrooms, whiteboards by pollybrown2013. Bookmark the permalink. So useful these tune ups — love the way it allows kids to be observers, linguists, really, studying variation and response at the same time developing confirmation of some of the rules of formal written language. “Kids can’t resist writing on whiteboards with those vivid and deliciously slippery erasable markers.” So true. I loved those boards when I was a kid. I’m 21 now. This class sounded like a “fun” experience, but I could tell work was being done. That’s the best way to learn. I relate to the grammar struggle as a student. Even in high school they had to really force time in for grammar. Sometimes we even had to cut a book in English class, and just read the 3 or 4 required books. Usually 4. It was a bummer because my sister never got to read Lord of the Flies. At least I got to. You teachers try very hard to fit what seems like 2 years of work into 9 months or so. Good job.